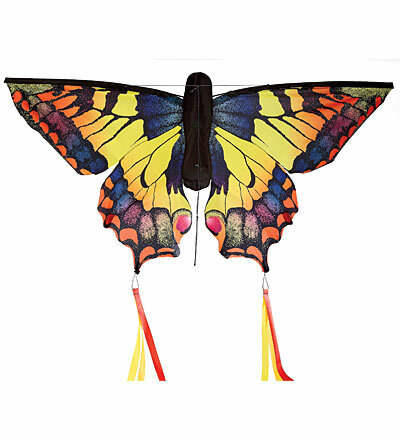 This beautiful Swallowtail Kite will give you wings and send you soaring. What a great way to spend a summer afternoon. It can provide hours of great entertainment for the whole family at that special summer picnic. Designed to look like a colorful swallowtail butterfly. The sturdy construction will last for years of flying fun. This great Swallowtail Kite will send you soaring! The kite is crafted of ripstop polyester with a durable fiberglass frame, and includes streamer tails and flying line. It is 31"H x 51"L to really catch some air. It can also double as a great outdoor decoration. For more information or to order, click here.